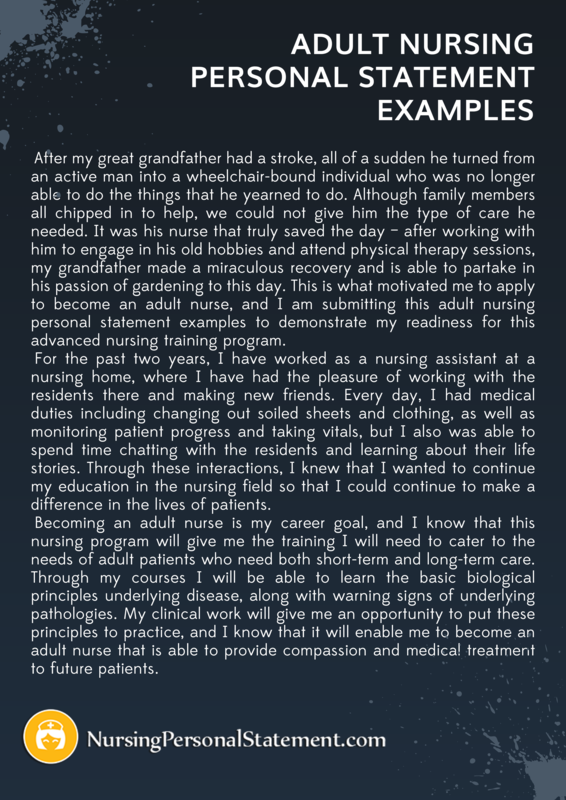 One of the biggest challenges in applying for an adult nursing course is to convince your readers that you are suited for the program. Submitting your official transcript of records, resume, and other supporting documents is all well and good but don’t forget to work on your nursing personal statement for adult nursing some more. Why bother with writing personal statement for nursing student? Well, this is where you get to talk more about yourself than in any paper in your application. It is here where you get to show your uniqueness and qualifications that can’t be found in your resume. Your personal statement for nursing school can carry weight when it comes to assessing your application which is why you should learn how to write one like a pro. 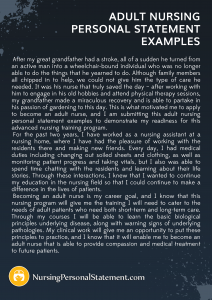 If you’re going to look at adult nursing personal statement examples you will find that most of them have a good introduction. This is important because you will need to pique the interest of your reader right from the start. The succeeding paragraphs should then be about your reasons for wanting to pursue this course, your strengths, your skills, and relevant details as to what makes you a perfect candidate for the program. Make sure that what you are writing highlights your best attributes because this is your chance to separate yourself from the rest of the applicants. The conclusion of your statement should be a reiteration of the strong points in your statement as well as an engaging ending that will prompt your reader to learn more about you. It is important that your paper follows a format to help make your statement more understandable and professional looking as well. So you’ve written a draft of your statement. Good job! The question remains, however, is whether you did a good job with it or not. Many applicants are just happy with what they can manage, praying that their resume will be enough to be considered for the course. Unfortunately, this is the wrong way to go because you need to keep in mind that there are others who will be competing for this position. A good rule of thumb when it comes to writing your statement is to ensure that you are writing relevant data only. There is no need for you to embellish stories in your statement just to make a good impression because it is easier to fact check nowadays compared to before. Focusing on your strongest skills as well as providing background on what made you decide to pursue this course are good points to include in your statement. Don’t forget to double check your draft to see if there are any grammar errors that you may have missed so you can make adjustments before submitting your work. If you feel that your paper needs more work, calling in the cavalry is a must. Improving your personal statement for adult nursing is possible especially when you know which service to approach for help. The good news is that our writing service is the best place to get expert assistance because you will be working closely with writers who are all degree holders to ensure that you are getting the best statement in no time, whether it’s a personal statement for child nursing or adult nursing. All that you have to do is fill out our order form, pay the fee, and we’ll assign a writer to work on your personal statement immediately. Choose our writing team today and get a fully customized personal statement for adult nursing fast!